Going through a breakup with your significant other is not the easiest life transition. It can be very challenging, sad, stressful, confusing, complicated, and anxiety provoking. Whether you are the one who initiated the breakup or the one who was doing the breaking up, it can be a hard mixture of emotions to navigate. While a feeling of heartbreak is a normal response while going through a breakup, it is also an opportunity for some self-reflection. The time right after a breakup is an important time to just sit in the array of emotions and figure out the important takeaways. Just because the breakup may be a hard experience does not mean everything about the relationship was a completely negative experience or a waste of your time. In the end, it can allow for significant personal growth. Below is simple guide on how to cope during this difficult time. • Sit with the uncomfortable feelings. It can be very effective to allow yourself to sit with the uncomfortable feelings in the present moment. It is likely that if you keep pushing away the uncomfortable feelings, those feelings will keep coming back. If you find it challenging to let yourself feel these tough feelings, maybe schedule a certain day and time to turn on some sad music and allow yourself to feel whatever you’re feeling in the moment. • Reflect on why it happened. Through sitting with the uncomfortable feelings, you can better understand why the breakup happened. Just because someone breaks up with someone, does not mean one individual did something wrong, it could be simply a lack of compatibility which is not anyone’s fault. • Get closure. This can look different for each individual, as some people may want to have a follow up discussion with their ex to provide unanswered questions since the initial breakup day, while others may just want to get rid of items that remind them of their ex. Do what works for you! • Time to shine! While a breakup is challenging, it can allow you to truly identify what aspects of your life bring value, whether it’s family, friends, or tapping into a new hobby or interest you lost sight of while being in your relationship. • What did you learn about yourself? While your emotions are still very fresh, use this time to reflect on all of the things you learned about yourself while you were with your previous significant other. This could be a good opportunity to journal all of your thoughts with some relaxing essential oils. • What do you want in future relationship? With this newfound wisdom of what you learned about yourself, you can reflect on what you want in your next relationship. Maybe even making a list can be helpful. • Self-care! When you feel ready, get out of your home and do something special for you. This can look like simply building structure in your daily routine. Attempt to find a healthy balance between allowing both sad and happy time during your day. Give yourself some positive self-talk by writing down some affirmations to yourself. Going through a breakup with your significant can be very challenging. 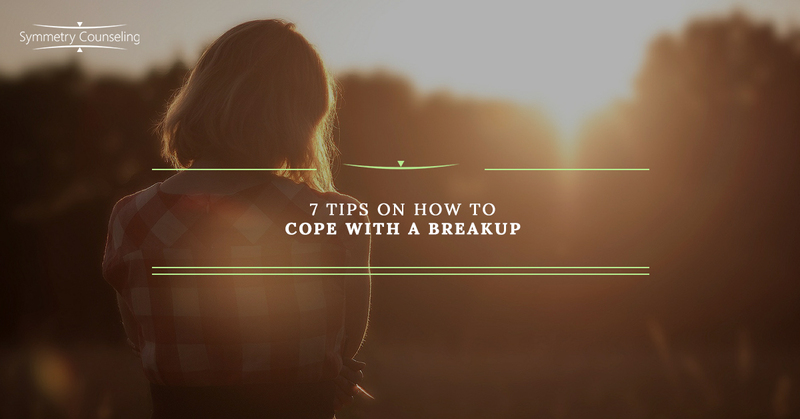 While this list provided a variety of ways to cope during a breakup, try to focus on the one(s) that you think will help you the most, as you truly know you more than anyone else. If you are currently struggling with a breakup with your significant other, it may be a good idea to connect with one of our skilled counselors at Symmetry Counseling today. You can contact them at 312-578-9990 to set up an appointment.